A middle-aged african american man smiles while reviewing blueprints. Excerpted from Disrupt Aging: A Bold New Path to Living Your Best Life at Every Age by Jo Ann Jenkins, published by PublicAffairs, a member of the Perseus Books Group (2016). 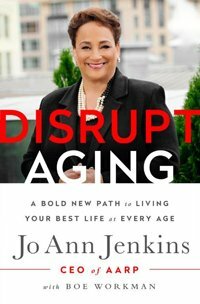 Learn more about AARP CEO Jo Ann Jenkins, the #Disrupt Aging movement and the book Disrupt Aging. All of AARP's royalties from the Disrupt Aging book sales support the charitable work of AARP Foundation. Author Jo Ann Jenkins receives no payment or profit from Disrupt Aging book sales. An interview with Jo Ann about "Changing Our Views on Aging"
Jo Ann's article about "The Future of Housing"
On the surface, choosing where to live as we get older seems like a simple decision. In fact, most of us have already made it: 90 percent of us want to age in our own homes and in the communities we know, not with relatives, in nursing homes, or in assisted-living facilities. Yet, as we age, many of us look around at our homes and communities and find that they are no longer a good fit. We may need to adapt or create home and community environments that support healthy aging and continued productivity — and nurture our desire to lead purposeful, meaningful lives as we get older. Far too often, however, just the opposite happens. Our homes and communities become roadblocks. There can be physical roadblocks like stairs that we have more difficulty navigating, or infrastructure roadblocks like stairs that we have more difficulty navigating, infrastructure roadblocks like poor street lighting, or roadblocks that stem from personal changes like no longer wanting or being able to drive while living in a suburb or rural area. The truth is, just about anything can become a roadblock to living a full and independent life if we let it. So in creating more livable homes and communities, we must identify and remove the roadblocks that exist in our homes and communities. Or better yet, stop creating them in the first place. In the last generation or two, homes in America have changed significantly, and mostly for the better. The wooden I-beams that we now use are lighter, stronger and cheaper than two-by-twelve joists, providing better protection from storms and earthquakes and making homes more affordable for those who, decades ago, may not have been able to afford them. We now have double-glazed tilt windows and amenities like master bedroom suites, built-in vacuum systems, home theaters and entertainment rooms. Houses, townhomes and apartments these days are quite different and generally much more desirable than those built in the 1950s and '60s — with one exception: they don't accommodate their owners as they age. With very few notable exceptions, American housing today has way too much in common with houses built 100 years ago, when the average life expectancy was less than 50 years old. Think about it: when life expectancy was only about 50, most people could manage stairs well enough. Fewer people lived long enough to need wheelchairs or walkers, so narrow thresholds, doorways and halls weren't a problem. Fewer people grew old enough to suffer from arthritis in their hands and joints, so round doorknobs worked just fine. By and large, people didn’t worry about downsizing their homes when their kids moved out because we weren't building McMansions back in those days. Many of those houses are still occupied in neighborhoods around the country, and as new models were built, the designs didn't change much. But today, with more of us living into our 80s and 90s and wanting to stay in our own homes as long as possible, these kinds of homes just don't work anymore. Smart solutions and customizable worksheets can make a home comfortable, safe and a "great fit." Most of us understand the need to save for retirement, right? We may not do it, or may not save enough, but at least we know we should. There's no such awareness about the modifications we might need to make to our homes as we get older. 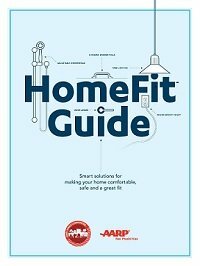 How many of us plan ahead for home modifications we'll eventually need? How many of us are installing handheld showerheads, grab bars and cabinets with pull-out shelves? How many of us do these things — but only after we've been dealing with the frustration for way too long? After all, the value of our home is measured by more than a price tag; it's also measured by its ability to make us physically comfortable and sustain us through each phase of our life. For people whose personal mobility is slightly diminished, nonslip treads on stairs and better lighting in the stairwells and hallways can make an enormous difference. So can, for example, grab bars in the bathtub and lever handles instead of round doorknobs. Another must is to have at least one zero-step entrance into the home. There are many instances where simple and inexpensive additions or modifications like these can make a huge difference. Such "universal design" elements accommodate the needs of people of all ages. It's common sense, but we rarely ever stop to think about it. Having a lot of steps leading up to the front door of a house is as inconvenient for a stroller as it is for a walker or wheelchair. Wider hallways, if not needed for wheelchair access, can make a great place to put bookshelves and still leave plenty of room for walking. These kinds of designs make homes more flexible and more likely to be places where we can age in place. With our population aging, it's time to recognize that basic access should be built into and around our homes just like the wiring and the plumbing. A livable community is livable for people of all ages. The "Imagining Livability Design Collection"
The "AARP Livable Communities A-Z Archives"